Iran Says U.S. Has Detained 'Press TV' Journalist And Calls For Her Release Marzieh Hashemi's son tells The Associated Press that his mother was detained on Sunday at Lambert International Airport in St. Louis. U.S. law enforcement agencies have declined to comment. 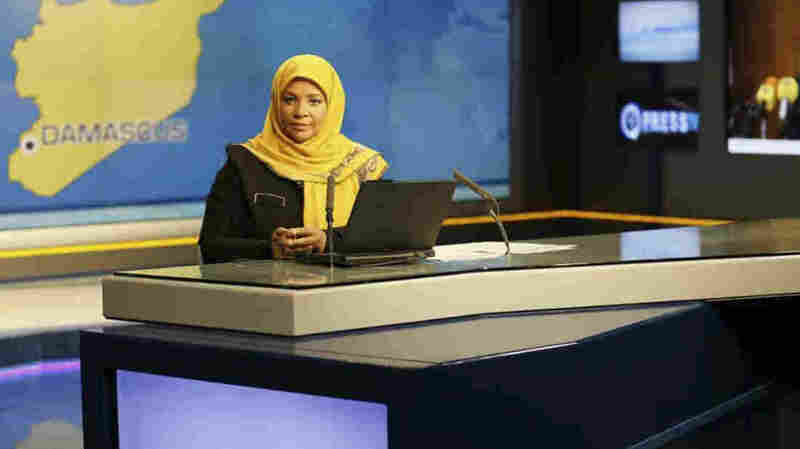 American-born news anchor Marzieh Hashemi sits in a studio in Tehran, Iran. Her eldest son said Wednesday that she was detained on Sunday and is being held without charge. Iran's foreign ministry is calling for the immediate release of an American-born journalist who works for an Iranian state broadcaster and who is believed to have been detained in the U.S.
"The custody of Iran's reporter in the U.S. is highly political and she should be released immediately," Foreign Minister Mohammad Javad Zarif was quoted as saying by the Islamic Republic News Agency. 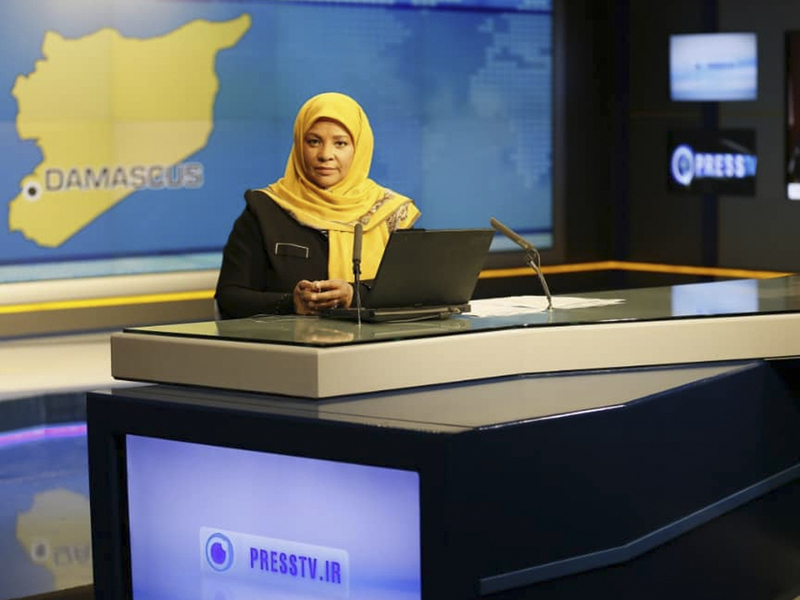 Marzieh Hashemi, 59, works for the English-language news service Press TV in Iran. Hashemi lives in Iran but was shooting a documentary in St. Louis, according to The Associated Press, which spoke to her son Hossein. Hashemi was heading to Denver when she was detained on Sunday at Lambert International Airport in St. Louis, her son told the news service on Wednesday. He said she was transferred by the FBI to a detention facility in Washington, D.C., and had not been charged with a crime. "We want more clear answers," Hossein Hashemi said in a separate interview with Press TV. "The fact that she has not been charged has made it difficult for us to know what kind of lawyers to pursue and what route forward we should go with ... we have hard time understanding how someone who is not charged can be held in a facility like that." Hashemi told the AP he has learned his mother is being held as a material witness. Federal law allows for the detention of a person who is "material in a criminal proceeding" if it seems that person is unlikely to respond to a subpoena. Marzieh Hashemi was born Melanie Franklin in New Orleans. She converted to Islam in 1982 and moved to Iran in 2008, where she worked for Iran's English-language state-owned news service Press TV, according to the AP. The news service says she holds Iranian citizenship. Hossein Hashemi says his mother is being treated as an inmate, not a witness, in a Washington, D.C., detention facility. "She is currently in prison, she has an inmate number, she is behind bars," he says. Forty-eight hours passed before she was able to contact her children, Hossein Hashemi says. She has been eating only pretzels because the prison food does not meet her dietary restrictions, he says, and her hijab was removed during processing. Hashemi told the AP that he and his siblings have received subpoenas to appear before a grand jury in Washington. He did not respond to NPR's phone calls seeking comment. Press TV chief Peyman Jebelli says his organization will take "any legal action that will be necessary" to support Hashemi and obtain her release. Iranian media have echoed Tehran's outrage at the arrest of Marzieh Hashemi. One called her detention "Saudi-style behavior with a critical journalist," the AP reports. It was a reference to Saudi Arabian journalist and Washington Post columnist Jamal Khashoggi, who was killed in the Saudi consulate in Istanbul in October. Commentators on Twitter have also equated the two journalists. Trita Parsi, an Iran expert and professor at Georgetown University, tells NPR, "I don't think that argument is necessarily going to stick. I don't think the parallels are that particularly strong." However, he notes that the detention of Hashemi comes after Iran detained U.S. Navy veteran Michael White. At least three additional U.S. citizens are being held in Iran, NPR reports. "As tensions between the United States and Iran increase, there seems to also be an increasing trend of citizens who may not be involved in anything falling in the crossfire between the two governments," Parsi says. Press TV has come under criticism for appearing too sympathetic to Iran's government. In 2013 the European Court of Justice placed the broadcaster on a human rights sanctions list after it aired forced confessions by detainees who had endured torture. In a 2009 interview with NPR's Scott Simon, Marzieh Hashemi defended the regime of then-President Mahmoud Ahmedinejad and his expulsion of foreign media after a violent crackdown on protesters who challenged his election victory. Suzanne Nossel, CEO of the PEN America group promoting literature and free expression, says she is concerned Hashemi might have been targeted for her documentary work on the Black Lives Matter movement or in retaliation for Iran's detention of U.S. citizens. "Either case would be an egregious violation of democratic norms," Nossel says in a statement. "It would be shocking to see the U.S. following the model, often employed by China and Iran, of detaining citizens of a country they consider hostile on spurious grounds, including to serve as a bargaining chip. If there are other grounds for Hashemi's detention they must be made clear, otherwise she should be released immediately." U.S.-Iran relations are unlikely to improve soon. Secretary of State Mike Pompeo has announced a conference in Warsaw in February, and he has hinted Iran will be a key topic. "We'll work on many issues, including how it is we can get the Islamic Republic of Iran to behave more like a normal nation," Pompeo told reporters in Qatar. NPR's Ryan Lucas contributed to this report.